DESCRIPTION: The Pine Bend Brook is a beautiful trail through open hardwoods as it follows and makes minor tributary crossings. The soft grade continues as it turns right after approximately one mile then makes two quick and rock hop crossings of Pine Bend Brook at its tributary. 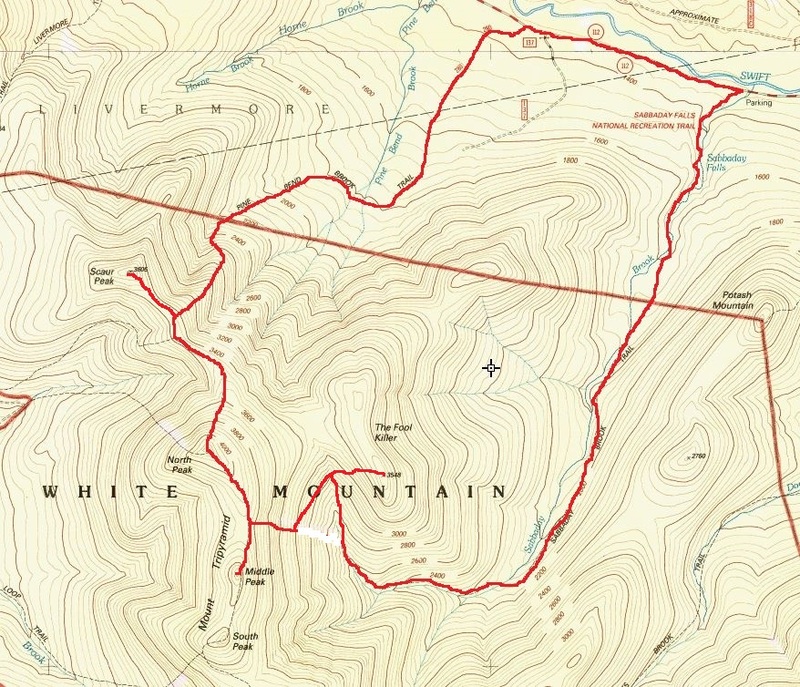 Several small crossings continue and the incline becomes slightly more moderate and at 2 miles, crosses the Sandwich Range Wilderness boundary as it soon becomes steep and rough paralleling a stream and rising up through a birch forest. The trail makes a sharp left makes a final crossing and steeply gains the ridge soon reaching the height of land. The Scaur bushwhack begins at the obvious height of land point on the Pine Bend Brook trail. The bushwhack is a distinct herd path leading through hobblebrush with multiple signs of moose as you traverse the narrow ridge. The narrow ridge line makes it easy to distinguish the 'trail' if you do get misaligned in the hobblebrush. The trail ascends the southern flank of Scaur and becomes difficult to follow through a few downed trees but can be found again with careful examination from the opposite side. The summit is in heavy trees and marked with a Scaur sign. There is no register. Follow your foot steps back to the trail. The Pine Bend Brook trail dips slightly then turns south reaching the junction of the Scaur Ridge trail after 0.2 miles. Continue south as the terrain becomes rocky and steep often requiring hand holds on the slippery slabs for 0.8 miles to the 4180 foot North Tripyramid summit. The summit is wooded and marked with a cairn on the tallest rock and offers directional views from several side trail outlooks. The Mt. Tripyramid trail begins its descent starting rocky and steep but the first few tenths of a mile then becomes more gradual reaching the junction of the Sabbaday Brook Trail after 0.5 miles. 4140 foot Middle Tripyramid is a long and difficult 0.3 miles away over very steep terrain that finally becomes easier as it pops out onto the summit. There is a cairn at the summit and directional views in several different directions. The Fool Killer can be seen through the tree foliage off in the distance. The Fool Killer got its name from the early map makers who were attempting to hike N Tripyramid and reached The Fool Killer summit before realizing it was a sub peak. Descend the Sabbaday Brook trails steep grade 0.75 to 1.0 miles where the trail meets a stream and makes a 90 degree turn. My coordinates were N43 58.274, W71 25.882 and just under 3100 feet elevation. The biggest difficulty is the short technical brook crossing. The remaining bushwhack is due west through beautifully open woods. It's a short 0.2 miles to The Fool Killer summit but slow going due to the brutally steep slope. I attained the summit after 15 minutes of hiking. The fool Killer summit is marked with a sign and PVC summit register. There are no views. I evaluated several descent options. 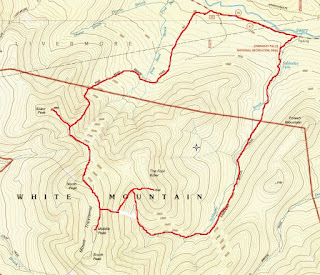 The first was to make a straight line route following the elevation contour to the N Tripyarmid trail, another option I considered was to descend the southeast ridge and pick up the Sabbaday Brook trail at a lower elevation. I opted to retrace my steps through the open woods back to 3100 ft elevation on the Sabbaday Brook Trail. I didn't look forward to the steep 1000 foot climb back up and over N Tripyramid and I decided descending 4.0 miles on the Sabbaday Brook trail with a 1.0 mile road walk but is much less strenuous on tired and sore legs. The Sabbaday Brook trail is approximately 4 miles along a long and straight trail with a very gradual decline. The longer but less strenuous route was ideal for my tired and sore legs. The trail crosses Sabbaday Brook and it's tributaries countless times making it adventuresome yet you will have wet feet. I would not recommend this route after heavy rains or in winter. * Disclaimer - I prefer not to use terms like final crossing in my descriptions due to the vague nature (when on the trail how does one know this is the final crossing) of the description however the final crossing is at a high elevation and the trail continues away from the stream bed making this a good reference point. Scaur Peak and the Fool Killer are both on the list of New Hampshire 100 highest peaks, both North and Middle Tripyramid are on the New Hampshire 4000 footer list. This was a strenuously long hike with more elevation gain than I anticipated. When plotting my route I planned to return from the Fool Killer ascending N Tripyramid and returning Pine Bend Brook to my car. When descending Sabbaday Brook from the junction of the Mt. Tripyramid trail my legs were burning and I knew ascending was not an option and the choice to descend Sabbaday Brook was a wise decision. The trails gradual grade was easy on my sore legs. The 1 mile road walk is not fun but it's not overwhelming either. There should be plenty of cars and tourists at Sabbaday Falls who may be willing to offer a lift.